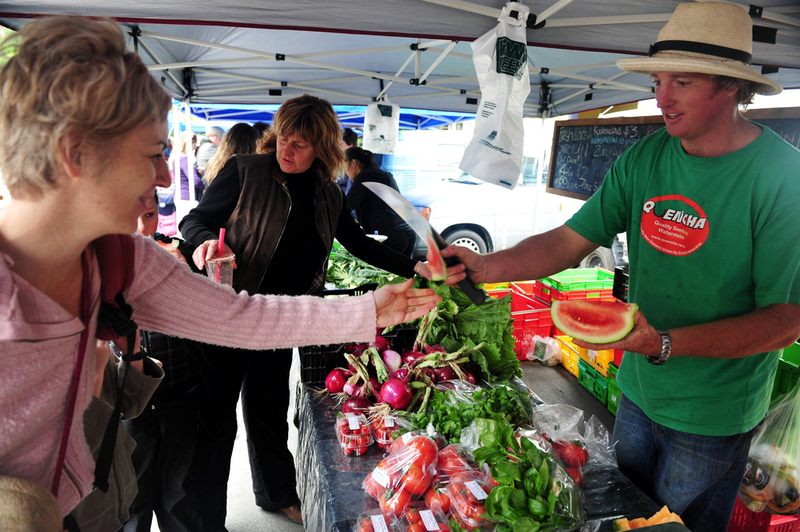 It’s spring, and many of us are re-discovering our local farmers' markets. But how do you know if those first-of-the-season bunches of asparagus, peas, and onions were grown by the farmer who’s selling it to you? Once upon a time, back in the 1980s, farmers’ markets were pure. Local farmers gathered in convenient public places to sell food directly to customers, bypassing faceless wholesalers and giant supermarkets while nurturing a nascent American foodie culture. At least that’s the image that some hold dear. Things are more complicated today. Collectively, farmers’ markets are now big business, growing from 1,744 markets in 1994 to 8,268 in 2014 according to the U.S. Department of Agriculture (USDA). And with that growth has come incentive for fraud; in particular, vendors passing off produce as locally grown, when in fact those tomatoes, heads of lettuce, or peaches grew far from the vendors’ fields. “We don’t want garlic from China and we don’t want strawberries from Chile,” says Fiona Harrison, market manager for the Charles Town Farmers Market in West Virginia. Harrison had established a “Know Your Vendor” program in 2014, largely as a marketing tool. But when a major fraud case at a nearby market broke later that year, she realized her nascent program went beyond sharing farm stories. It was about something much more fundamental; it was about maintaining trust. Harrison made participation in the Know Your Vendor program mandatory by incorporating it into the market’s rules and regulations. Now all vendors must agree to a site visit by representatives of the market steering committee, who will try to verify that products sold at the market actually are produced by the vendor. It’s unclear how widespread vendor misrepresentation is nationally, but anecdotal information from market managers and farmers around the country, and at least one eye-opening news story in 2010, suggest that it’s common—and often goes undetected. Usually, misrepresentation involves supplementing farmer-grown crops while slipping in others grown elsewhere and hoping no one will notice, such as selling mass-produced cucumbers among local heirloom tomatoes. Mass-produced goods from a wholesaler generally are cheaper than those just-picked by a small, local producer. Yet produce at farmers’ markets can fetch a premium price from customers who value freshness and want to support local agriculture. Supplementation allows vendors to increase their profit margins by passing off cheaper goods they didn’t produce as their own, and pocketing the premium. Catching such supplementation is tricky. Thayer has inspected more than 260 farms throughout 38 of California’s 58 counties since AIM launched its audit program in 2010. His in-depth process involves comparing each farm’s stall at the market with its Certified Producer Certificate—issued by the County Agricultural Commissioner, that lists the crops that each farm grows—and visiting the farm the following week to make sure the stall, the certificate, and the crops in the field are all in sync. California has one of the most rigorous state programs in the country, but the process still leaves room for cheating. County staff typically visit farms only once every few years, according to Thayer, and don’t require all crops listed to be growing in the fields when they do visit. “A farmer’s who’s going to cheat will tell the County Agricultural Commissioner every crop that they might grow, even if they don’t grow it,” says Thayer. “[Those] farmers are just putting everything on their Certified Producers Certificate now.” It can also take weeks for state and agricultural departments to inspect a violation reported by a market. By then, Thayer says, the farmer can just claim that the crop is gone. AIM has removed seven farms from its markets in the past three years after it conducted its own in-depth inspections. Six other farms removed themselves when they learned that Thayer would be examining their fields, suggesting they didn’t think they could pass the test. Overall, however, Thayer estimates that 95 percent of AIM’s farmers are in compliance with its producer-only market rules because of the extensive audits they undergo before their farm is allowed into the market. He says other market participants suspect that up to 50 percent of farmers might be cheating elsewhere. California is working to remedy the issue. In 2014, the California Department of Food and Agriculture reported more than 40 violations in which certified farmers were selling products they didn’t produce or operating without a valid certificate. That same year, the state legislature passed a new law requiring all certified farmers to post signage indicating that they grow what they sell. Lying is now considered a crime, with much stiffer penalties than in the past, including fines of up to $5,000 for each incident—a substantial increase from the few hundred dollars typically fined in the past—or imprisonment of up to six months. It remains to be seen if the new law creates incentive for greater compliance. State laws vary and many states leave producer requirements up to individual markets. But farmers and markets across the country that want to participate in the federal Farmer’s Market Nutrition Program (FMNP), do have to meet certain basic requirements for locally produced food. FMNP is designed to provide low-income consumers, such as those receiving federal aid under the Women, Infants, and Children supplemental nutrition program or low-income seniors, access to fresh local produce. State agencies administer the program, but federal rules define “locally grown” to mean produce grown in-state (or in some cases, adjacent states), and require states to conduct annual on-site monitoring of at least 10 percent of participating farmers and markets. The rules provide little guidance on what that monitoring should entail. Considering the violations flagged by more comprehensive auditors such as Thayer at AIM, it seems likely that the opportunity for farmers to sell non-local produce via the FMNP program remains high. Large, prosperous market associations such as AIM can afford to hire trained staff to conduct rigorous farm audits, but not all markets can. Costs vary greatly depending on each farm’s size and complexity, such as the variety of products sold and the number of properties involved. But Thayer estimates that a typical audit costs about $900, not including travel expenses. Similarly, Greenmarket in New York City manages a network of more than 50 farmers markets that operate throughout the city’s five boroughs and runs a rigorous inspection program. Its crew visits every farm within three months of its application, conducts crop inventories, audits farm sales, and reviews product lists to verify vendors’ claims. Greenmarket charges vendors a $200 entrance fee, and then spends $100 to $1,200 per farm inspecting and auditing production. In contrast, the Charles Town Farmers’ Market operates in a small town and hosts only a few dozen vendors. Harrison, along with a steering committee of vendors, run the market themselves, and are just too busy during the peak growing season to visit many farms. For smaller farmers markets without the resources of Marin or New York, self-policing might be the key, according to Samuel Wiseman, a law professor at Florida State University who studies food policies. Producers know one another, regularly drive by neighbors’ properties, and recognize supplemental items in the market stall at weeks end. “It hurts me if the guy next to me is selling junk, and my peaches are more expensive because they were just picked,” says Emily Zaas, who runs Black Rock Orchard in Carroll County, Maryland. Some markets, particularly those that are new and struggling to attract vendors and customers, might avoid confronting a violator for fear of damaging the market’s reputation and reducing its small customer base even further. But Wiseman believes self-policing can be effective when multiple markets compete for customers in the same region: Locavores can always go somewhere else if they suspect fraud. That’s certainly the case at the Takoma Park Farmers’ Market, one of several markets in the Washington, D.C. metro area where Zaas sells her fruit. Takoma Park has long nurtured a reputation for authenticity in a community that values local food, and it guards that reputation fiercely. Vendors must produce everything they sell, including the milk for their cheese or the cabbage for their sauerkraut. And unlike most markets, vendors become co-owners of the Takoma Park Farmers’ Market Corporation once they’re accepted, with a vested interest in maintaining that authenticity. With only 23 slots, opportunities to enter the market are rare, and the membership weighs each application carefully, visiting sites, questioning farmers and applying their own expert knowledge of farming to judge applicants. Those admitted to the market must accept the responsibilities of vetting new applicants, an often time-consuming process. But Zaas echoes what Thayer and other market inspectors claim. “The honest farmers welcome inspection,” she says. Photos, from top: ChameleonsEye / Shutterstock.com , Arina P Habich / Shutterstock.com. This is a great article, thanks for writing. As a farmers' market manager I'm a little shocked at the top photo, our local health department would NEVER allow someone to sample raw cut melon like that without gloves and direct hand to hand contact. Especially with a large knife in hand! Is there such a program in play for Canadians. I'm very interested in what you're doing and think is great. We need something like that here in Canada. Great article ... and congratulations on using the proper plural possessive, "farmers' market". It's lonely sometimes, this business of being right.